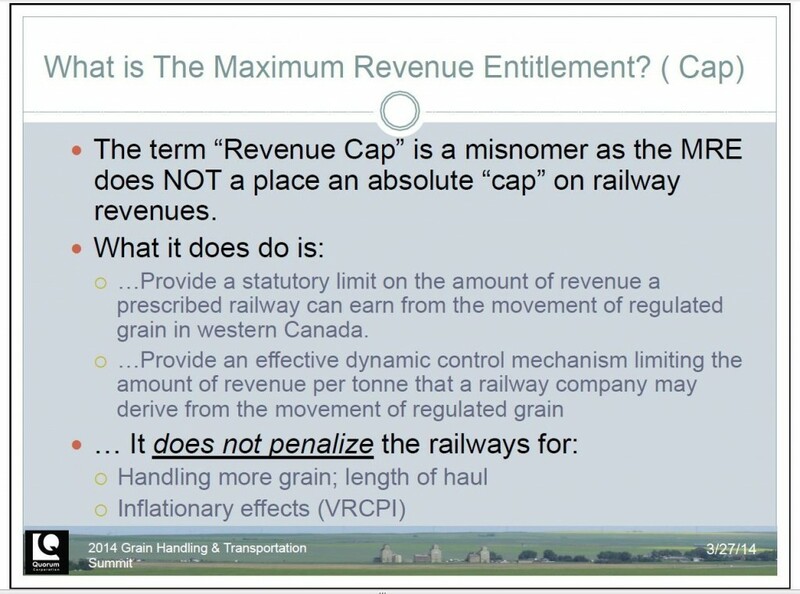 The revenue cap does not restrict how much grain or any other commodity railways move. Since they are oligopolies they are simply restricted from exercising their full market power over grain companies and other commodity shippers. The revenue cap is adjusted for inflation in railway costs each year. It is essentially a guaranteed income for the railways. The revenue cap is not adjusted for “productivity gains” by the railways. This provides them with an incentive to modernize their equipment and operating procedures so they can make more profits. How much can Canada’s national railways charge to move the millions of tonnes of regulated Western Canadian grain each year? A good question with a lot at stake for both grain shippers and railways, particularly given the challenges facing the grain-handling and transportation system this crop year. For most Prairie farmers and shippers there is only one practical way to get their grain to market — by rail — and primarily only one provider of that service, either Canadian National or Canadian Pacific. The current legislative regime struck a compromise between the desire of grain shippers to be protected against railway market power, the railways’ objective of having a more commercially oriented grain transportation system, and the need for all to have a degree of predictability. The former maximum rate-setting process was replaced by this new program whereby Parliament gave the Canadian Transportation Agency the responsibility each crop year for determining what CN and CP may earn for moving regulated western grain to market. Based on the extensive media coverage, there appears to be a fundamental misunderstanding about what the “revenue cap” is and more specifically what is “capped.” This leads me to explain the legislative formula that establishes the maximum revenue entitlement. Essentially, this formula established the average rate per tonne that the railways could earn at the beginning of the program, and which is adjusted each year by a railway inflation index (called the volume-related composite price index, which is in many ways similar to the consumer price index) and the distance travelled. This annually adjusted average rate per tonne is then multiplied by the overall tonnage of grain moved by each railway. It should be noted that while the formula takes into account inflation, it does not incorporate any productivity adjustments. Having said that, in 2007-08, the agency was asked to determine the actual costs of maintaining hopper cars and thus took into account the productivity gains associated with this particular cost category. After examination, the agency determined the actual maintenance costs for hopper cars were $33 million, not the $105 million that were then reflected within the formula. A one-time $72-million downward cost adjustment was thus applied to the maximum revenue entitlement. Clearly, under this regime the more grain that is being moved, the more revenue the railways are entitled to earn. So while the program is often referred to as the revenue cap, it is not in fact, a cap on how much grain the railways can move, rather it is a cap on the average rate that railways can charge. The railways have the flexibility to set differential rates for moving western grain as long as the total revenue they earn does not exceed the entitlement determined by the agency. Within revenue-cap limitations, railways are free to set their own individual freight rates for all commodity movements, including Schedule II grains. They do so through both the railways’ published tariffs and through commercially negotiated agreements with the shippers. Railways are also free to prioritize the commodities they carry as long as they fulfil their legislated obligation to provide adequate and suitable service to all shippers. The Canada Transportation Act contains several provisions designed to facilitate the resolution of rate and service disputes between carriers and shippers. Common carrier obligations (under sections 113 through 116) deal with the railway companies’ service obligations, while final offer arbitration can be used to settle rate disputes. Lately, there has been much discussion about the effect of the revenue cap on the movement of western grain. As a quasi-judicial tribunal and economic regulator, the Canadian Transportation Agency neither takes sides nor makes policy as it is clearly a matter for Parliament to decide. However, the agency considers it important this public debate be based on facts. The fact is there is no cap on how much grain CN and CP can move. While there is a cap on the average rate, adjusted for railway inflation and distance travelled, they can charge per tonne — the more grain that CN and CP move, the more they earn.